Well, we all know that M.E. has its drawbacks, and that we can't do things as quickly as other people. We have to start early to get things done. 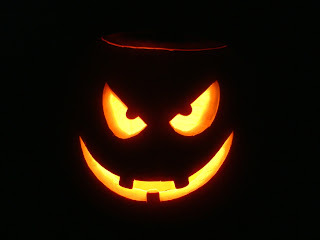 With this in mind: Three months today is Halloween! Given the amount of time we spend indoors our complexions can easily be likened to that of ghosts, our daylight aversion to that of vampires. What better time to dress up, have fun and illustrate our illness? So, why not start putting together your Halloween crafts or getting ideas down on paper? Perhaps, if you feel up to it, think about putting on a Halloween crafting event! With crafters starting early in order to contribute to stalls etc. we should be able to manage a fair ol' Halloween haul, spooking people out of their hard-earned money with gorgeous goodies and fun-tastic crafts. You could even spice up your sales with a seasonal special, or a game for your stall! Get your thinking caps on - comment on this post and start the toffee-apples rolling! In a fun ol' holiday of spooky things, fancy-dress, sweets, tricks and terror there are virtually no limits! So let's get going! If you think you may be able to run an event or contribute crafts then do let us know. If you have any ideas or concepts you want to spread to other crafters then we can easily share it on the blog. Start the pumpkin rock! Let's cook up some crafts! I'm thinking of knitting small huggable pumpkins, if I get hold of some orange wool! Swamp Kids do it for M.E. Make ME Crafts. Powered by Blogger.